THE PURCHASER IS RESPONSIBLE FOR DETERMINING THE SUITABILITY OF THE TT-1 WIDE BAND CONTROLLER PRODUCT. Dynamic EFI warrants that the TT-1 WB Controller (the hardware) will be free of defects for a period of one year from the date of receipt. Remedy: Dynamic EFI's and its suppliers' entire liability and your exclusive remedy shall be, (a) return of the price paid (if any) for the Product, or (b) repair or replacement of the Product, that does not meet this Limited Warranty. There is no warranty provided on the sensor. Dynamic EFI makes no warranties whatsoever, expressed or implied with regard to the software provided with the TT-1 WB unit product. The right to make changes in design, add to, or improve upon product without incurring any obligations to change the same on products previously manufactured is expressly reserved. Buyer agrees to indemnity and hold seller harmless from any claim, action or demand arising out of or incident to the buyer’s installation or use of the TT-1 WB product. The TT-1 WB product is protected by copyright and other intellectual property laws and treaties. Dynamic EFI or its suppliers own the title, copyright, and other intellectual property rights in the Product. The TT-1 Wide Band (WB) controller is for users that require an accurate AFR reading and an easy to use system. The TT-1 outputs may be used to interface with a data logger, engine management unit, or an AFR gauge. There are two analog outputs from the TT-1 unit. These are both programmable for the output voltage range (within 0 to 5 volts) and AFR/Lambda range. Output A is dedicated as a WB output. 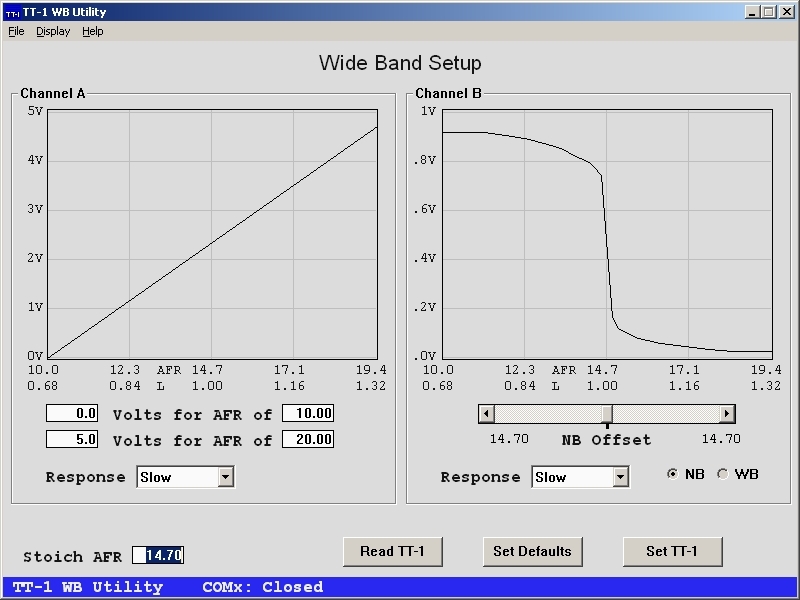 Output B can be either a simulated narrow band (NB) output or a WB output. The TT-1 WB utility program runs under WIN98, Win2000, XP, Vista and Windows 7. It uses a USB interface to the TT-1 controller. This utility program is used to set up the output voltage vs. AFR/Lambda ranges, update the TT-1 firmware (if required), and has a AFR/LAMBDA display. The WB sensor gets very hot. Allow it to cool before attempting to remove it from the exhaust. If powered up in free air be careful not to burn yourself or to ignite any nearby combustibles (including vapors such as from gasoline, propane, and so on). Whenever the engine is running the WB sensor is also required to be running. The sensor may be damaged when in the exhaust of a running engine without being operated by the TT-1. Along the same lines, do not run the WB sensor for more then a few minutes unless the engine is running. Be sure to install the sensor with the tip facing a downward slope. This is to prevent exhaust condensation from collecting inside of the sensor. See the sensor mounting guidelines further along in this document. The CD-ROM contains the USB drivers and documents along with the TT-1 WB Utility program (and this user manual). Install the TT-1 inside of the vehicle. Do not install the TT-1 box under the hood or outside of the vehicle interior. Purple: WB/NB output, this may be connected to the ECM NB input to provide a simulated NB signal. May also be used as a WB signal and connected to a gauge. *Note that the heater ground and system ground are not tied together within the TT-1 WB controller. This removes the affects of the heater current from the WB outputs. It also means that the grounding must be done correctly for proper results. Connect the TT-1 heater ground to the engine block. This will provide the best grounding for the WB sensor heater. The TT-1 system ground may be connected to the same point on the engine block. If the TT-1 system ground is connected to the data logger analog ground. 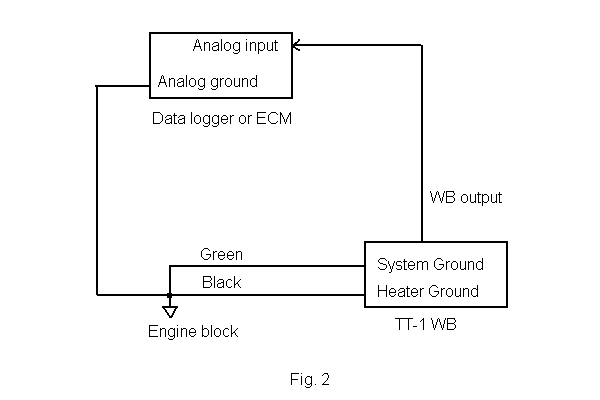 The data logger analog ground must also be tied to the engine block. Avoid chassis ground points, and grounds from other places in the vehicle. Use the engine block for all ground connections within the engine control and logging equipment. Try to use a single point (bolt or stud) on the engine block for grounds. The use of anti-seize will help in preventing corrosion and provide a good conductivity for the ground lugs. Figure 1 above shows the basic wiring of the TT-1 WB controller. In figure 2 the ground wiring is shown with the TT-1 heater and system grounds connected to the engine block. 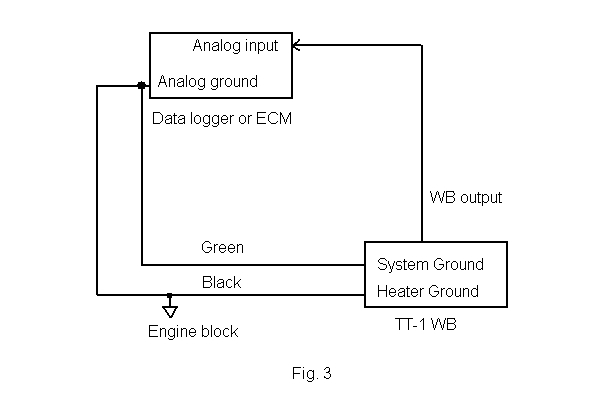 The data logger analog ground is then connected to the same point on the engine block. 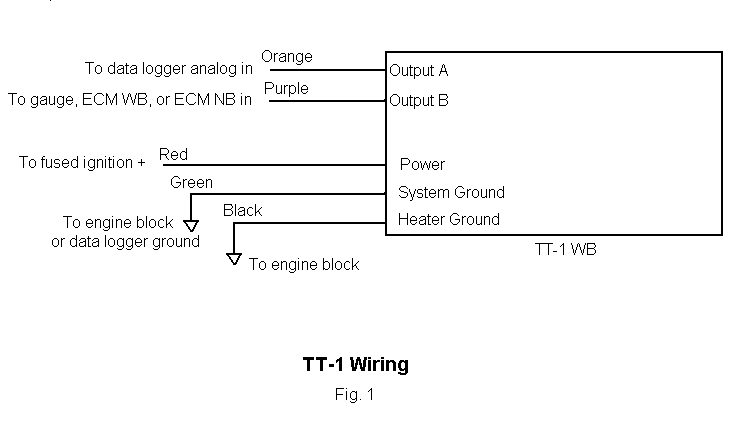 In figure 3 the ground wiring is shown with the TT-1 heater and data logger grounds connected to the engine block. The TT-1 system ground is then connected to the data logger. A sensor mounting bung is provided. This may be welded into the exhaust at a convenient location. Note that the WB sensor is sensitive to excess heat and exhaust back pressure. It is recommended that the sensor be mounted at least 3 feet from the engines exhaust ports. Do not install the sensor in the exhaust manifold near the cylinder head (this is the stock NB location for some vehicles). Do not install the sensor between the exhaust ports and the inlet of a turbocharger. Do not install the sensor after a catalytic converter, always prior to one. After welding the mounting bung it is recommenced to run a spark plug thread chaser or tap through the threads (18 mm x 1.5 mm). Tighten the sensor to between 30 and 40 foot-pounds of torque. Do not over tighten! The sensor cable must not come into contact with the exhaust system. Be sure to tie off the cable to prevent contact with the exhaust system, suspension, and so on. Do not let the cable hang down under the vehicle. If it catches on road debris damage will ensue. Install the sensor with the tip facing a downward slope. Note that the sensor may be mounted from the left, top or right side of the pipe. Just be sure that it is installed with at least a 10 degree downward facing angle. The TT-1 uses a USB interface for the purpose of set up, firmware updating, and the AFR/Lambda display via the TT-1 WB Utility program. To do this an FTDI USB driver is required. Your PC/laptop may already have an FTDI driver installed. If so there is no need to reinstall them, although an updated driver may be required. The FTDI USB drivers may be found on the supplied CD in the "USB Drivers & Instructions" folder. There are detailed instructions for driver installation within that folder (as PDF files). Note: Once completed the install dialog will appear again, take the same steps as before. It is a two part install and is normal for the install dialog to appear twice. Once the drivers are installed you can connect to the TT-1 WB controller. Using the supplied A/B USB cable connect one end to the TT-1 controller and the other to your laptop. For most of the Windows operating systems the TT-1 WB Utility will automatically connect to it. You may also select the "Find TT-1" entry under the File drop down menu to initiate a search for the TT-1 controller. For WIN98, and sometimes (rarely) on one of the other USB capable Windows O/S's the search does not work. In this case use the "Comm Setup..." entry under the File drop down to define the proper COM port. Click the "Fixed COM Port" radio button and in the adjacent drop list select the proper COM port. The easiest method to find which port the TT-1 WB is using is with the Device Manager. Turn off the power to the TT-1, open the "Ports (COM & LPT)" entry and note the available COM ports. Then power up the TT-1 and note which port then appears. That will be the proper COM port for the TT-1. If the red LED illuminates at power up the TT-1 WB unit is in a programming mode. 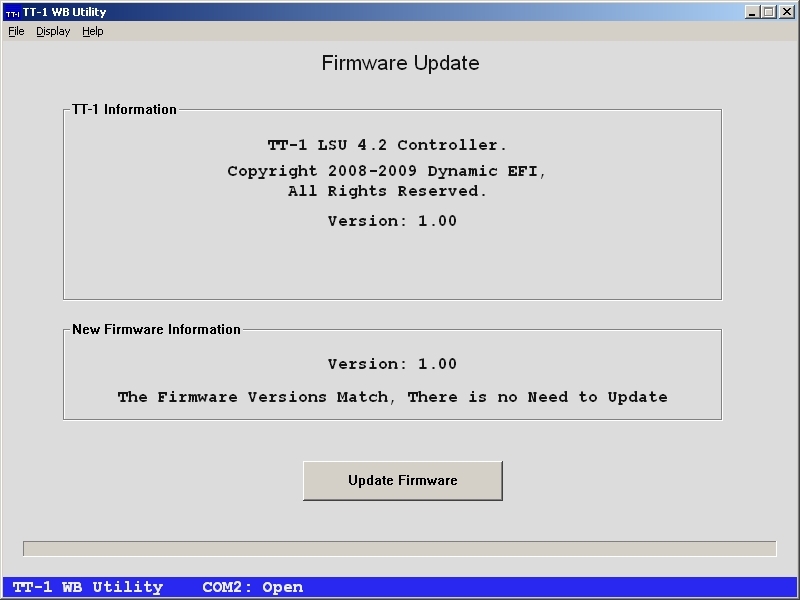 In this case update the firmware via the TT-1 WB Utility program. Then set the desired output channel voltages and AFR via the set up display. A simulated NB output. It is centered on stoich (lambda of 1). To change the output programming use the Windows TT-1 WB Utility provided on the CD. This utility allows the user to change the range of the analog outputs, update the TT-1 WB unit firmware, and has a display of the current WB AFR and lambda. Channel A is the dedicated WB output. Channel B defaults to a simulated NB output. It may also be used as a WB output by selecting the "WB" radio button. The "Stoich AFR" entry defines the AFR for a lambda of 1. The "Response" entry defines the level of filtering. The slower the response the smoother/slower the output. The NB output can be offset from stoich. This may be used when running in closed loop for a richer or leaner AFR. The output voltage ranges from 0 volts to 5 volts, and may be set anywhere in between. The AFR ranges from 0 through 210. Although this is a little extreme, there may be a case where the end values are desired. Note that an AFR of 207 is typically free air. The bottom of the display has a blue status bar. It shows the name of the program along with the port number and whether it is open or closed. The TT-1 WB Utility will auto select the proper port once the TT-1 WB unit is powered up. The port selection/opening logic may be reset by choosing the ALT-F, Find TT-1 menu selection. Note that from the time that power is applied to the TT-1 it can take up to 6 seconds to open the port. Key-on, engine-off, wait for port to open (see COMx on status bar), click the "Read TT-1" button. If no error messages pop up the display will be updated with the current set up in the TT-1. Click on the "Stoich AFR" edit box and type in the desired stoich AFR (14.2). Click the "Set TT-1" button. A progress bar will appear above the three buttons. Once the TT-1 update has completed the progress bar disappears. You can key-off or start the engine. When using the TT-1 WB unit on a chassis or engine dyno the AFR/Lambda display may be utilized. This display is accessed via the Display, AFR & Lambda menu key (ALT-D, A). With the TT-1 WB unit is powered up and the sensor heater up to temperature the display will show the current AFR and lambda value. Note that the displayed AFR is based on the stoich value programmed into the TT-1 WB unit. As data arrives the spinner in the upper right will rotate. There are a few settings for the AFR/Lambda display in the Preferences dialog (ALT-F, F). The range of the target area may be set. This can be seen as the red area on the gauge between 0.86 and 0.88 Lambda. The other setting is the response rate of the display. It is a filter to smooth the reported AFR & Lambda values. A few notes about AFR and Lambda: an O2 sensor (both WB and NB) read Lambda. 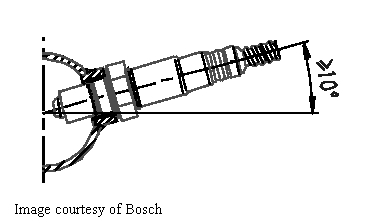 A Lambda of 1 is stoich for all fuels. However, the stoich AFR will vary according to the fuel type. 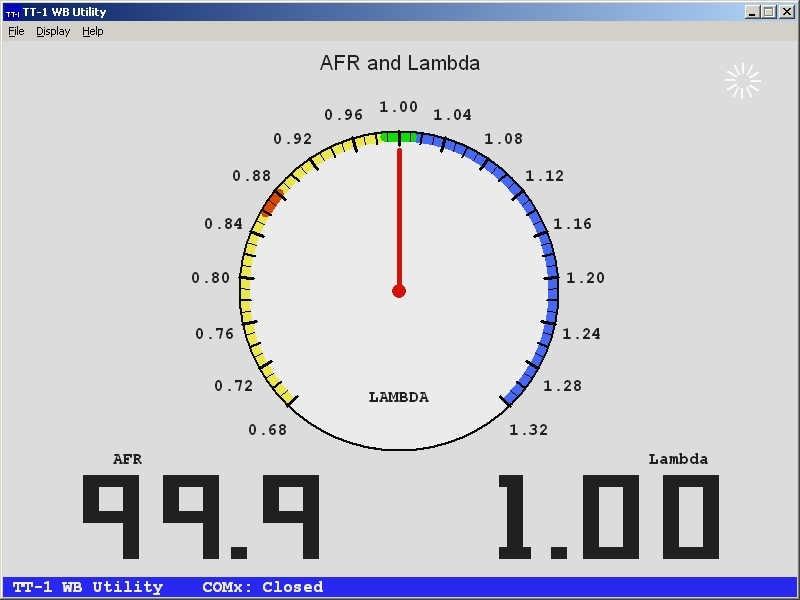 Looking at the above AFR & Lambda display the AFR is being reported as 99.9, with a Lambda of one. This is due to the display not yet receiving any data from the TT-1 WB. The display defaults to a lambda of one, but does not know what the stoich AFR is supposed to be. That information is sent by the TT-1 WB unit once it connects and starts to send data. The AFR & Lambda display receives the reported lambda value along with the stoich AFR value that is programmed into the TT-1. Between the two the current AFR is calculated and displayed. This display is used to update the TT-1 WB unit firmware. The firmware is the instructions that run the TT-1 WB unit. The firmware update display will auto-connect to the TT-1 WB unit. It will read the current firmware version and compare it to the available firmware version. You may then chose to do the update or stay with the present version. It typically takes 10 to 20 seconds to do the firmware update. During the update please leave the TT-1 and PC/laptop powered up along with leaving the USB cable plugged in. The progress bar will increment along with showing "Programming...", "Verifying.. ", and "Done..." messages. Copyright 2009 - 2011 Dynamic EFI, All Rights Reserved.